Terming the Citizenship (Amendment) Bill 2016 as wrong from all aspects and against the ethos of the country, former union finance minister Yashwant Sinha on Sunday said that the Bill will not be passed in the Upper House even as the veteran politician predicted that the BJP government will never come to power again. 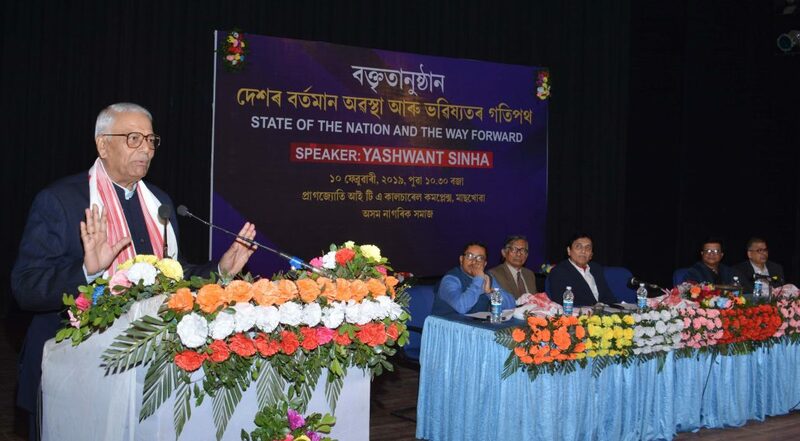 Sinha said this while delivering a talk on the topic of ‘State of the Nation and the Way Forward’ organized by Asom Nagarik Samaj in Guwahati on Sunday and urged the people of the Northeast to be united to ensure that the saffron party does not get a single seat in the forthcoming Lok Sabha polls in the region. “Both the Houses of Parliament are being stalled. Besides that, I have been interacting to different people before coming here. I understood that except BJP, other political parties are firmly against the Bill. I doubt that the ruling party will dare to pass the Citizenship Bill in Upper House amid ruckus. As the ongoing session is the last Parliament session of this government, there is no chance that the Bill will be passed,” he said while adding that there is nothing to worry as this government is not coming to power again. “I can tell you with confidence that this government is not coming to power for a second time. So there is nothing to worry. In case you are still worried, just wait for another two days with patience,” he said while addressing a packed house at the ITA Pragjyoti Cultural complex in Guwahati. He said that the entire north-eastern states are facing an existential question due to the Citizenship (Amendment) Bill 2016. “If someone tries to end someone’s existential, people will object and protest. The people of the north-eastern states are objecting and protesting as they are facing an existential threat due to this Bill,” he said extending his support to the agitation against the Bill. “I feel the Bill is incorrect from all aspects. From legal, constitutional, Assam Accord and from all points of view the Bill is incorrect. It is also against the ethos of the whole country. So I stand with you all in opposing the Bill and I’ll be ready to fight against the Bill whenever you want me to,” he said while appealing to the people of the Northeast to be united to ensure that the BJP does not get even a single seat in the forthcoming Lok Sabha polls.